Nothing adds to the ambiance of nighttime parties as well as candlelight. These geometrically shaped lanterns are sure to add festivity to any party. They look complicated but actually are quite easy to make. Just follow this step by step tutorial and you will have awesome lanterns to decorate your outdoor party area! 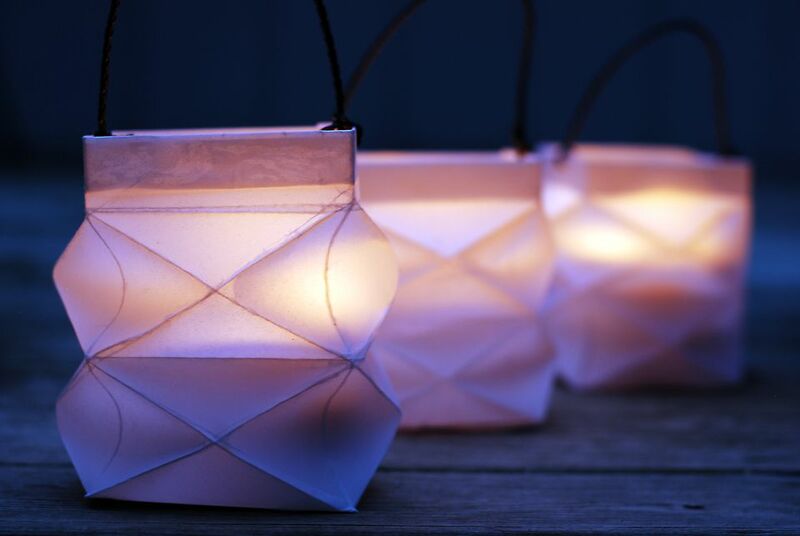 This pretty paper lantern can be made by hand, or cut on a digital die cutting machine. Print the PDF template onto the 11” x 17” sheet of white card stock. If your printer does not accept 11” x 17” sized paper, go to a quick print or office supply store. They have machines that are able to print on larger sized sheets of paper for a small charge. Cut out the template with a craft knife and ruler. Score the fold lines with a ruler and bone folder. Fold all the scored lines towards the back of the paper and then once again towards the front. Lay the sheet of paper flat on a layer of paper toweling. Brush the entire sheet of card stock with vegetable oil. Hold the paper towards a light to make sure all areas of the paper are covered with oil. Use more paper toweling to blot the sheet dry. The oil is what causes the paper to be translucent. Awesome!!! Let the paper dry for a few hours. Select the appropriate die cut file for your digital die cutter and cut out the lantern. After your oiled paper has dried for a few hours, you can start folding and gluing the lantern together. Make sure to use tacky glue, other glues do not work as well with oiled paper. Fold the top of the lantern cut out over once as in the photo above. Apply tacky glue to the inside of the top flap. Fold the top flap of the lantern cut out over once again as in the photo above(a total of two folds). This fold will form the top edge of the paper lantern. Apply tacky glue to the front of the side flap. Place the outside part of the flap onto the right inside edge of the template to form a four-sided lantern. Fold the bottom flaps and glue together with tacky glue. Allow the lantern to dry for a while before handling again. (*Optional) To give the lantern some sturdiness, cut out two 4 inch squares from thick card stock or cardboard. Glue one cardboard square to the inside of the lantern bottom, and one square to the outside of the lantern bottom. This will give a firm foundation to the bottom portion of your lantern. Allow the card stock cardboard bottoms to dry before placing a candle inside of the lantern. Your lantern should now look like the illustration above. To get that awesome geometric look start folding the diamond shapes inward at the corners using gentle pressure. Crease the edges of the diamonds with fingers if needed to enhance the geometric look. Continue folding and creasing each diamond inward. If you have successfully followed all of the previous steps, Your lantern will now look like the photo above. Victory! These lanterns can be used on tables just as they are. If you want to hang them, punch two holes on the top edge with a paper punch, and insert some cording to form a handle. You may then insert a candle or battery operated tea light. Always use common sense when burning candles, never leave a burning candle unattended!